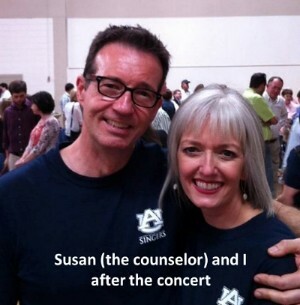 Except for the past two years I’ve spent as a Christian, my four years at Auburn University rank as some of the best of my life, due pretty much to my participation in the university’s choral music program. As a music education major, I had the privilege of studying music theory, choral arranging, and voice under some learned and accomplished instructors. Although my voice teacher, Sam Timberlake, didn’t stand a chance of making me into a great singer, we had a blast during my voice lessons. When he wasn’t singing me his favorite honky-tonk song, he was having me out to his house in the country where he had built his own meat smoker out of a galvanized metal garbage can and spent his spare time trying to duplicate the barbecue sauce recipe from Big Bob Gibson’s, a popular barbecue joint in the home town we both shared. When he shifted into classical music mode, though, his big booming basso profundo voice would rattle the walls. But the person who taught me the most and made the biggest impact on my burgeoning musicianship (and subsequently, my life) was my choral director and choral arranging instructor, Dr. Thomas Smith (also from my home town – there must be something in the water). I sang under his direction in the Auburn University Concert Choir, a group of 100 or so singers devoted to performing the best of classic choral literature, and the Auburn University Singers, a 32-voice ensemble performing lighter pop and show music complete with choreography and an instrumental ensemble. As this year marks the 40th anniversary of the Singers, Drs. Smith and Farmer and a committee of dedicated former group members planned a fun and exciting reunion event on and around campus that I had the great pleasure to attend recently. The weekend events kicked off with a reception Friday evening that provided a chance to reconnect with old friends, some of which I haven’t seen since we sang together 30 years ago. The people I sang with ended up sitting at one big table at the reception (security in numbers). In spite of the inevitable physical changes 30 years can cause, as I sat looking around the table to which we had all gravitated, I was struck by the fact that we had held up pretty well – which totally ruined all the jokes about bald heads and wrinkles I had planned for this post. But more importantly, over the course of the night I discovered we had all grown into some pretty fine adults. Matt, the former fraternity president, is now a church administrator; George, the former cheerleader, is a doctor and leads worship in his church. Mitch, who played (and still plays) a killer guitar, is also a doctor and active in church. Jean started out as a contemporary Christian recording artist, then answered God’s call to become a well-known and beloved Christian children’s entertainer (check out her blog). Both Susans are shaping young lives, one as a much sought-after university counselor and the other by leading a troupe of high school thespians in some of the finest theater productions in the Southeast. Carol is a music editor. John put in his time teaching and is about to start a second career. Cathy is a pharmacist – and can still remember (and do) all of our songs and dance steps (obviously she has access to the best memory-enhancing drugs). Several of these folks have even had, or currently have, children in the group. After meeting Mitch and Kim’s son and David and Brenda’s son, Matt and Tammy’s (beautiful) daughter, and all four of John and Kim’s boys, I’m pleased to report that good parenting skills apparently abound among my former classmates. What a blessing to see these fine young-uns who are so much like their parents; makes the future seem a little more bright. In between rounds of catching up, we enjoyed a fashion parade of past outfits, all featuring some shade of the school colors of orange and blue. While some have weathered the test of time and show choir fashion, most tended to elicit a chorus of laughs and groans, with those of us who wore them shaking our heads and looking at each other with “Did we actually think we looked good in that?” looks on our faces. During the day on Saturday we got together with others from our years in the group and rehearsed some of the numbers – complete with choreography – we did when we were actually lithe and limber enough to do some of those moves. These were to be performed the next day at a special reunion concert. Although there was a lot of fun and joking around as my group tried to remember and rehearse our assigned high-energy tune with its ridiculous range and busy dance steps, you’d be surprised how quickly a room full of 50-something professionals can get down to business when the end of rehearsal is drawing near and the specter of public humiliation looms large. The highlight of the reunion banquet that evening was a performance by the current group of Auburn Singers, an amazingly talented bunch of young singers and dancers (no standing in the back and faking it with any of these kids) under the direction of Dr. Dale Farmer. And from the looks on their faces and the caliber of their performance, it was evident they were as excited to be singing for us as we were to be listening. In honor of the 40th reunion, Dale planned a program featuring classic Singers numbers from the past, some “future classics”, and songs written or arranged by former group members. He had asked me to write an arrangement of a lovely ballad from the 90s recorded by the late Nancy LaMott called “Listen to My Heart” and chose to premier it at the reunion concert. 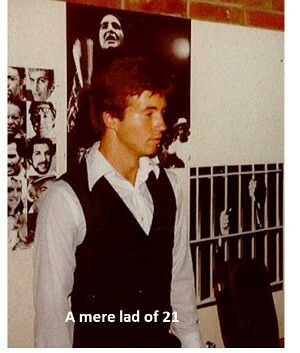 And if that wasn’t honor enough, he (and the talented young man who played piano for the group) graciously indulged me by letting me accompany the group that night. The group did a beautiful job and I was transported to some sort of piano playing arranger heaven. The reunion performance Sunday afternoon was a fitting finale to the weekend events. Everyone had a ball getting back on stage again and belting out some of those (vaguely familiar) old tunes and (less familiar) dance steps. Since the audience was mostly made up of reunion attendees and our family members, though, having the wrong jazz hand up or going left when one should have gone right just made it that much more fun. 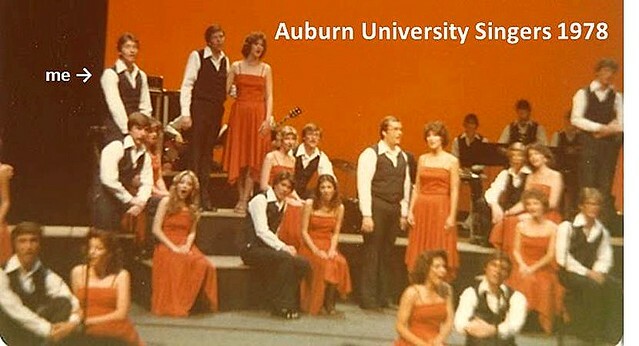 However, I don’t think any of us really came to the reunion just to sing and dance again – in the end, the draw for an event like the Auburn University Singers reunion is the chance for those of us who loved and cherished and shaped this group 40, 30, or even just 3 years ago to see that legacy still going strong. So while the outfits, hairstyles, and choreography have changed, the excited and youthful facial expressions onstage, the goodwill shared through music, and the obvious love for the group and the institution it represents are still the same; and I feel certain that will never change.